The evidence, however, paints a picture of support from AFL Queensland including development staff. This is also translating to big junior numbers across the nation joining programs and a rapidly growing women’s game. According to the AFL Queensland website, the game in PNG is well run and growing. 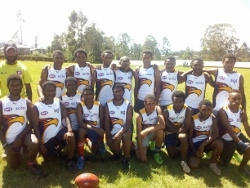 “AFLPNG Development are the AFL’s development arm in Papua New Guinea, with 20 full-time staff and a strong focus on development and talent. The team at AFLPNG Development conduct Coaching, Umpiring and Match play programs across six provinces of PNG, with approximately 70,000 boys, girls, men & women annually, aged from 5 – 40 years taking part. The AFLPNG Development “Paradise Foods Niukick” program is the flagship introductory program to the sport of AFL used across PNG, teaching the basic skills of our game, as well as developing good behaviours around health, disability inclusion and gender-based violence. With a direct link to the AFLQ Talent pathway you will also see the PNG U/14 Binatang boys & U/17 Kurakum girls competing in the AFL QLD Youth Academy Championships each year. The nation has produced players who have gone on to AFL lists with Mal Michael the most celebrated after his career at Collingwood, Brisbane Lions and Essendon. Gideon Simon was on Richmond’s rookie list for a time and Brendan Beno was signed to the Brisbane Lions academy. David Meli was rookie drafted by Essendon. There have been and will be others. Alois sees pathways to the big time as the lure for both his West Eagles players and any others who want to pursue the game at a higher level – even via the strong AFL Cairns competition which is the closest. The game of Australian football was first played back in 1944 when Australian servicemen introduced the game to the nation. Since then the game has had ups and downs. The nation has been a dominating force at international level with their Mosquitoes team winning the 2017 International Cup in Melbourne. They have won that title three times since 2002 and never missed a grand final. They also backed it up with the Asian Champs title in Kuala Lumpar last year. The talent coming out of PNG is frightening. But, perhaps his view is restricted purely to a local club level, which is always a different prospect to the wider picture. Maybe his West Eagles are part of that drive to take the game in PNG back to its former lofty (by current comparison) heights. *This article expresses the view of the interviewee and does not reflect the opinions of World Footy News.